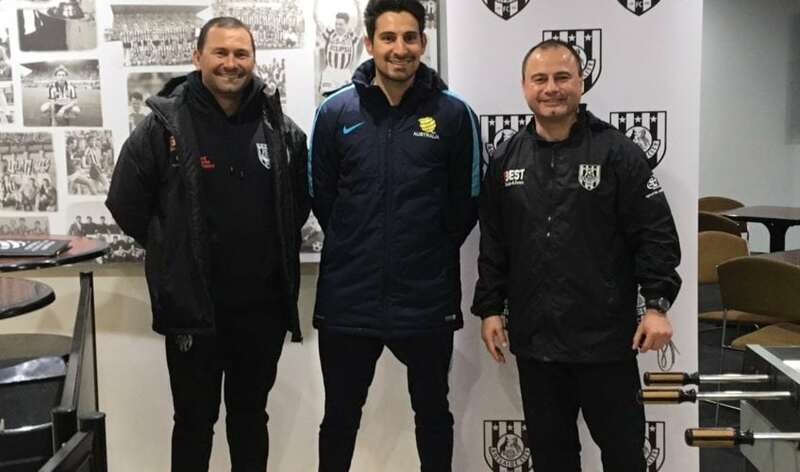 Mr Kevin Grima, Head of Boys Youth Development FFA, (center) is flanked by Adelaide City FC Technical Directors Rick Cerracchio (left) and Mario Pegoli (right) at Unley Park. Adelaide City Football Club welcomed Mr Kevin Grima, FFA Head of Boys Youth Development, to the club’s Unley Park facility last night. Mr Grima provided an insight into future direction and areas of focus for youth development in Australia. “The collaborative approach in conjunction with FFSA and FFA builds structure and quality, with the development of young players the winner of these working relationships” stated Adelaide City FC Technical Director Rick Cerracchio. The FFA official’s visit comes off the back of a successful FFSA managed tournament where he spent the week observing South Australia’s talent and junior workings. Grima was welcomed by Mr Rick Cerrachio, Technical Director & Mr Greg Slack, Corporate Services Director, along with a number of ACFC coaches, and viewed a range of Adelaide City youth teams from U8, U10, U11 up to U15. Adelaide City FC would like to thank Mr Grima for visiting the club and spending time with players and coaches. The club also thanks Football Federation Australia for its time and commitment to Football and Youth Development. Adelaide City looks forward to working alongside both the state and national federations in developing the next generation of Socceroos & Matildas. Junior Girls selected for FFSA!